At Cook Martin, helping small business owners and entrepreneurs is part of what we do. One of the things that often trips up people who are starting out in business is paying taxes. Our clients sometimes aren’t sure whether to put their employees on a salary or to pay them hourly. It’s a choice that affects your taxes, so it’s essential to understand the differences. Whether you have salaried or hourly employees – or both – it’s your responsibility to pay the employer half of their payroll taxes. This is not an area where you want to make mistakes. Running afoul of the IRS is not something that any small business owner wants to do. 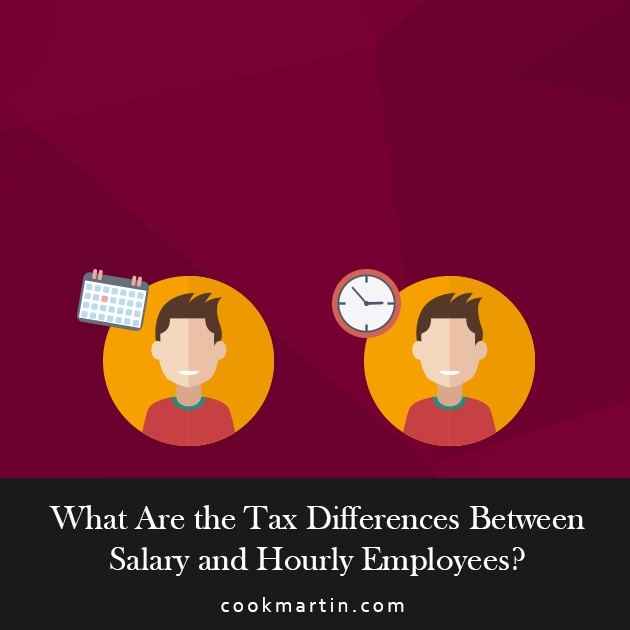 With that in mind, let’s look at some of the key tax differences between salaried and hourly employees. The first key difference between salaried and hourly employees is how their pay is calculated. Salaried employees earn a fixed amount each year. Many salaried employees are considered to be exempt from overtime pay, meaning that if they work more than 40 hours in a week they will still receive only their salary. By contrast, hourly employees are usually considered non-exempt. If they work more than 40 hours in a week, they must be paid for their overtime – usually at a rate of 1.5 times their normal hourly rate. In some cases, hourly employees who work on holidays may qualify for twice their normal hourly rate. The total amount of payroll taxes you pay depends on the amount of your payroll. That means there are pros and cons to having salaried or hourly employees. Let’s start with the pros of paying your employees a salary. With salaried employees, you know in advance how much your payroll will be each pay period. It doesn’t fluctuate, and for some business owners, the benefit of being able to predict tax payments is important. You don’t have to pay salaried employees extra for overtime. They’re expected to do the work detailed in their job description regardless of how long it takes. If they have to work 45 hours to finish their job, you won’t have to pay them extra to do it. Employees may like knowing how much they’ll earn each pay period. If you need to save money on payroll, it’s harder to do with salaried employees unless you want to have uncomfortable conversations about cutting salaries. Salaried employees usually have unlimited sick time and in some cases, employees may take advantage of that. There is a minimum salary an employee must earn to have exempt status, and in many cases, salaried employees may be paid more than hourly employees. Hourly employees are paid only for the hours they work. In some cases, you may be able to have an hourly employee work less than full time, thus saving on your payroll expenses. If you need to reduce your payroll, you can do it easily by shaving a few hours from your hourly employees’ schedules. Since hourly employees don’t typically get paid sick time, you won’t lose money if someone has to be out of the office. If you’re in a crunch and your hourly employees need to work overtime, you’ll have to pay them for it – and pay extra payroll taxes, as well. Hourly employees may resent having their hours cut and you might have to worry about turnover if you do cut them. Overtime hours (and pay) can add up quickly, so if your business is unpredictable, having hourly employees might be risky. You’ll have to evaluate your labor and business needs to determine whether you want to risk having to pay overtime to hourly employees. Which Businesses Benefit from Salary and Hourly Employees? You can see from the previous section that there are pros and cons for both hourly and salaried employees. That complicates things for business owners because there’s no easy answer as to which is better. However, we can provide you with some guidelines to help you decide how to proceed. First, it’s important to understand what your employees might expect. It’s traditional for high-level employees, including management and senior staff, to be on a salary. However, if you’re expecting people to work large amounts of overtime, you might get some resistance to the idea of moving to a salary – at least from some employees. By contrast, it’s usual for entry level employees and support staff to be paid hourly. Some may prefer the hourly pay if you expect them to work extra hours; others might prefer the stability of a salary. Of course, you’re under no obligation to take your employees’ preferences into consideration, but we still recommend thinking about it. Secondly, you should consider your monthly expenses and how they fluctuate. This is a big consideration when it comes to payroll taxes, which must be paid quarterly. If your company is one that isn’t seasonal, then you might very well prefer to have employees on a salary. That way, you can predict your monthly payroll and quarterly tax payments. You won’t have to guess – and if you do all employee reviews and salary increases at the same time, you can remove almost all the fluctuation from your payroll. On the other hand, companies whose revenues fluctuate greatly from month to month and from season to season may prefer to pay their employees on an hourly basis. During slow times and off-seasons, you can reduce your payroll and the resultant taxes by cutting back on employee hours or even letting some of your hourly employees go. The seasonality of your business is an essential component of your decision. When revenue is down, you don’t want to get caught with insufficient funds to make your payroll taxes. Nobody wants to run into trouble with the IRS. Third, you must consider some of the intangibles of having hourly and salaried employees. Earlier, we mentioned the issue of leave time and sick time. Usually, exempt employees don’t have limitations on their sick time. If you’ve got a salaried employee who abuses the privilege, you may end up losing money because you’re losing work from them. Hourly employees may be resentful if you cut their hours. They’re losing money while you’re saving it. Some companies who cut hours find that they have higher-than-expected employee turnover as a result. As you may know, it costs far more to hire and train a new employee than to retain an existing one, so that’s another consideration to keep in mind. Every business is unique. The decision of whether to put your employees on a salary or keep paying them on an hourly basis isn’t always an easy one. You’ll have to consider your tax burden, your overall payroll expenses, and the effect that one pay structure or the other may have on your employees. In general, seasonal businesses may be better off paying their employees hourly so they aren’t burdened with a high payroll (and high taxes) during the off season. By contrast, businesses with stable year-round revenue may like the predictability of paying most of their employees a salary. Learn how the bookkeeping and payroll services at Cook Martin can help you manage employment taxes for your employees.